ATONEMENT 2018: BIAFRA/YSREA-L ATONEMENT: YOM KIPPUR TISHRE 5779. The Indigenous People Of Biafra (IPOB) in Abakiliki Province joined Biafrans and Ysrea-l to observe this year's special atonement. 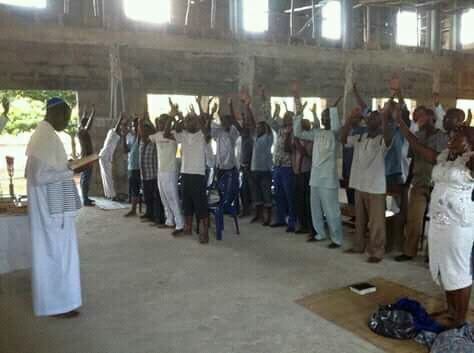 The members of IPOB in Abakiliki Province gathered at the House of Ysrea-l Assembly synagogue at Izhia, Ohaukwu LGA Ebonyi state (Abakiliki province) to join the Jewish faithfuls in the state to pray and atone for the forgiveness of sins and pave way for Biafrans as they agitate consistently for their freedom from the contraption called Nigeria. The 25 hours fasting and praying commenced sundown Tuesday to sundown Wednesday September 18 and 19, 2018, across Biafraland and Ysreal. Jews and Biafrans wherever they are all over the world observed atonement before entering into a new year to obtain favour from the sight of Yahweh to cleans them from sins and iniquities committed during the year. Jewish faithful all over the world does not take the period of atonement for granted, because it is a moment they reconnect and make amendment with Yahweh, their heavenly father, as to enter into the new year a new person according to the commandments of Yahweh to his chosen nation Ysreal and Biafra. In Abakiliki, members of Indigenous People Of Biafra (IPOB) who loves and cherish the Jewish way of worship to the creator of heaven and earth 'Yahweh,' enjoined the existing Jewish faithfuls on the atonement. Special prayers was offered for the state of Ysreal, Biafra, members of IPOB all over the world, the leader of the Indigenous People Of Biafra (IPOB) Mazi Nnamdi Kanu, wherever he is and for all the Jews all over the world. Among those who attended the special atonement were the Abakiliki Province Indigenous People Of Biafra (IPOB) Coordinator, Mazi Igwe Ogbonnaya, his Provincial executives and many principal officers from Ebonyi north, south and central senatorial district. Dr. Prince Kingsley Ogba, who is the high priest in-charge of House of Ysrea-l Assembly synagogue Izhia, during his atonement teachings, noted that "the only way Yahweh will forgive our sins is to forgive others who sinned against us, prayer is very important especially during atonement, because we seek and find the face of Yahweh"
Pastor Emmanuel while conducting the 3 o'clock prayer, explained that fasting and praying is one of the best means one can connect to Yahweh, the maker of heaven and earth. He therefore urged the Jewish faithfuls to always pray in and out of season.